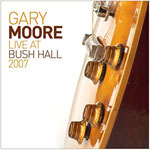 Share the post "Album review: GARY MOORE – Live At Bush Hall 2007"
One of my big regrets in recent years is not quite managing to interview the great Gary Moore. There was an opportunity when he toured in September 2009 but I wasn’t persistent and then he died suddenly less than two years later. I’d always admired his incendiary guitar playing and songwriting skills, dipping at times into rock, fusion or the blues, and sometimes confusing listeners and fans in the process. This Bush Hall gig is unique in that it was limited to only 400 punters courtesy of radio station Planet Rock who have previously broadcast the whole show. Moore was promoting then new album ‘Close As You Get’ and 7 of its 11 tracks are included. But with Brian Downey on drums there was a throwback to his earlier incarnation with Thin Lizzy and ‘Don’t Believe A Word’ cuts through an essentially blues-based set as the one concession to his rockier history. In his last few years Gary Moore still had the blues and his next studio album ‘Bad For You Baby’ continued a journey that began – in recording terms – with ‘Still Got the Blues’ in 1990. In this set he includes three tracks from that landmark album (‘Still Got The Blues’, ‘Too Tired’ and ‘Walking By Myself’) whilst ‘The Blues Is Alright’ recalls the follow-up ‘After Hours’. This entry was posted in ALBUM REVIEWS, ALBUM REVIEWS (Mobile), All Posts and tagged blues, Brian Downey, Gary Moore, guitar, guitarist, Live At Bush Hall 2007.album, Planet Rock, review, rock. Bookmark the permalink.